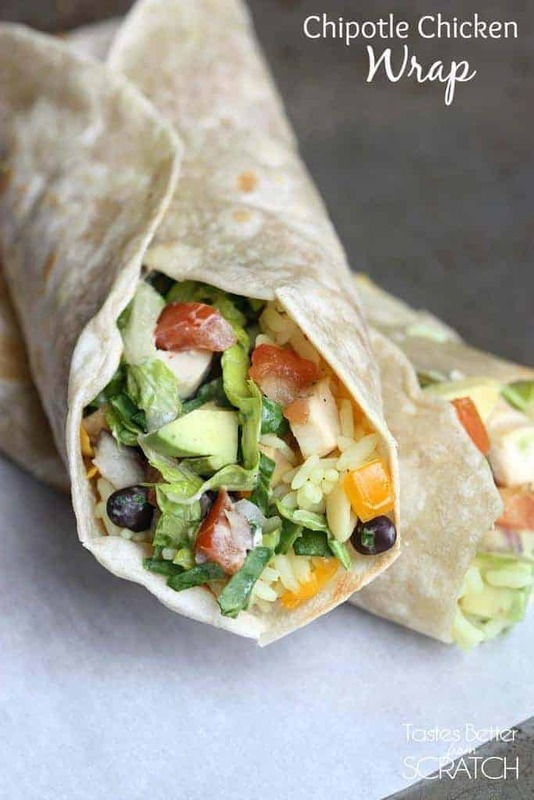 Chipotle Chicken Wraps with tomatoes, onions, black beans, avocado, bell peppers, and a yummy chipotle sauce all wrapped up in a warm tortilla! We have this awesome Dine-In theater nearby that makes for a great date night (whenever we can find a sitter!) Huge comfy recliners and an awesome menu that’s pretty inexpensive. A nice little waiter that will refill my Diet Coke all night long. Ya, it’s my kind of local Oasis. 🙂 Last time we were there I ordered a delicious Chipotle Chicken Wrap, and after taking one little bite I knew I had to recreate it. My version is healthier, but still every bit as delicious! I can always judge if a recipe is what I call “blog worthy” by my husband’s first reaction. I slyly watch him as he nonchalantly takes his first bite of dinner –when I see pure happiness cross his face, I know it’s a winner. I pretend like I’m not watching him…waiting for his approval. And when he spends the next several minutes (and several bites full of food) telling me how good it is, I mark it as “blog worthy” and dub it good enough to share with ya’ll. So let me present, super yummy, easy, scrumptious Chipotle Chicken Wraps! In a small bowl mix all of the chipotle sauce ingredients together. 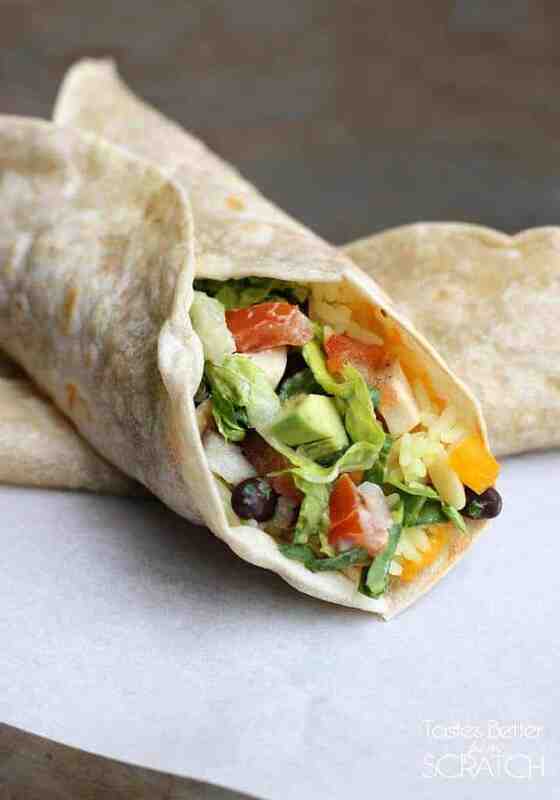 In a large bowl toss together lettuce, cooked chicken, tomatoes, onion, avocado, black beans, corn, and bell pepper. Add the sauce mixture (you don't have to use all of it if you don't want. I like to reserve some for dipping) and toss well to combine so that everything is evenly coated. Warm tortillas in the microwave for a few seconds. Layer each tortilla with about 1/4 cup cheese, 1/4 cup rice and a heaping spoonful of the salad mixture. Roll like a wrap and secure with a toothpick. *I like to use a rice pilaf, so the rice has some flavor. You could also use mexican-style rice. This looks like my kind of wrap! Loving everything about it! I love your awesome ideas for quick lunch and or breakfast quickies. Can’t wait to try these. Thanks for sharing. YUM! 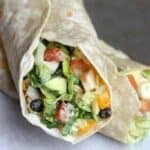 I love simple wraps and these were so good! They make life easier! I’m glad you liked them 🙂 Hope you get to try more of my recipes soon!